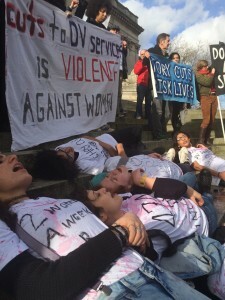 Sisters Uncut are a feminist direct action group protesting cuts to domestic violence services. They have previously stormed the ‘Suffragette’ film premiere and dyed Trafalgar Square fountains blood red. A member of direct action group Sisters Uncut was arrested and detained in Portsmouth today, after throwing confetti in a council meeting. 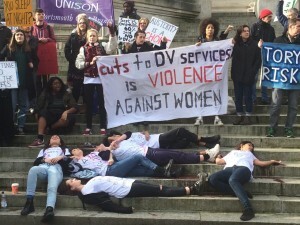 Sisters Uncut, known for visually creative protest methods, disrupted Portsmouth council’s budget meeting to protest sweeping cuts to local domestic violence support. They describe the arrest as “a ridiculous overreaction”. Sisters Uncut released 4,745 pieces of green and purple confetti into the council chamber, halting the budget meeting for 10 minutes. This number represents the number of domestic violence incidents reported to Portsmouth police in 2014/15. At the same time, the group unfurled a banner that read “Donna cuts, we bleed” in reference to Portsmouth Council Leader Donna Jones’ support for cuts to domestic violence services. Before the meeting, a crowd of around 200 people rallied outside the council building. 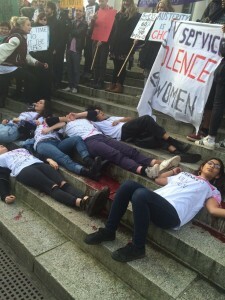 20 members of Sisters Uncut staged a ‘die in’, lying on the floor covered in fake blood. After the meeting, Sisters Uncut were met with aggression from council security and police. Police arrested a young woman from the group and took her into a locked room, guarded by security staff and other police officers. They denied a Legal Observer access to the room, and proceeded to search the woman. Members of Sisters Uncut state that “the police did not provide a legal basis for conducting the search”. The young woman was then taken to Portsmouth Central Police Station and detained for several hours. This is not the first time Sisters Uncut have targeted Portsmouth council. 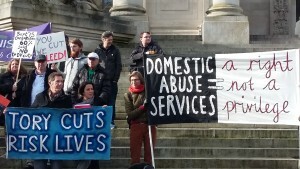 On Tuesday 8th December 2015, local domestic violence survivors and support workers joined Sisters Uncut to protest cuts during a council budget meeting. 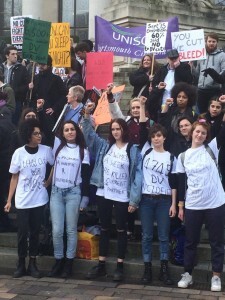 Sisters Uncut, who are calling for domestic violence services to be funded by central government, are protesting Portsmouth council’s proposed £180k cut to local domestic violence services. Domestic violence accounts for 31% of recorded assaults in Portsmouth. The cuts have met vocal public opposition, with members of the public chanting ‘shame on you’ as councillors entered yesterday’s budget meeting. The proposed cuts will reduce the number of specialist Independent Domestic Violence Advisors from 15 to 8. They will also remove a specially funded housing support worker who helps women fleeing abuse to avoid homelessness. Despite the risk of domestic violence being higher in the first year of a child’s life, the council plans to remove specialist domestic violence support for health visitors.